Found in remains of rubbish fire 40 years ago! 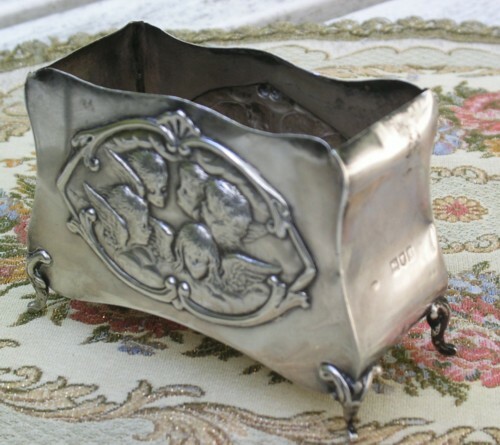 I hope I am correct in reading the marks, made in London by William Comyns in 1898, Sterling Silver. But what is it? We use it for holding Business Cards etc., but could it be a sugar basin? It is 75mm tall (incl. legs), 105mm at widest, 43mm deep. 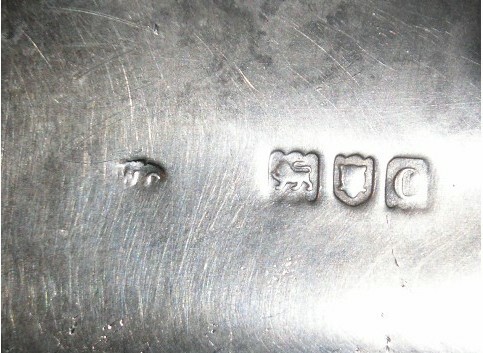 I believe it is an example of inexpensive die stamped items that Comyns produced for the mass market. It is also marked “Flavelle Bros” (Retailers in Sydney and Brisbane, Australia). I’d appreciate your opinion. You are right in thinking it was made by Comyns in London in 1898. I think looking at the piece that it was probably part of a dressing table set, as the design on the front (known as the Reynolds Angels, after Sir Joshua Reynolds painting - Circle of Angels), was often seen on hand mirrors, brushes, and jewellery boxes or powder jars. I should think that your piece was originally used to hold cotton wool or the equivalent. Thats no troubles at all.